MOVING PARK is selected for the Infill Philadelphia: Soak It Up! Exhibition hosted by the Community Design Collaborative, Philadelphia Water Department, and U.S. Environmental Protection Agency. The exhibition of over 40 projects designed to soak up stormwater and make cities more attractive, healthy, and engaging places to live is a design initiative exploring how green stormwater infrastructure can play an important role in revitalizing urban neighborhoods. 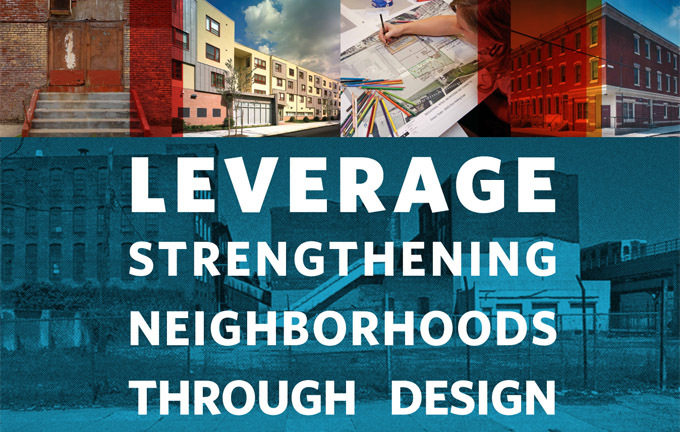 For more information about Infill Philadelphia: Soak It Up! click here. MOVING PARK will be on display from Monday, September 17 through Friday, October 19 at the Philadelphia Center for Architecture, 1218 Arch St from 10AM to 6PM Monday through Saturday and 12PM to 5PM on Sunday. A Philadelphia neighborhood-based moving park appears in one residential street, lingers for a day or two before disappearing to another, and leaves you wishing for its return. Was it real? Can imagination and education encourage the emergence of green stormwater infrastructure in older, ultra-urban environments? Understanding how the surface expression of these technologies impacts and possibly transforms a neighborhood is critical to its acceptance. As a continuously temporary quarter-acre park, MOVING PARK delights residents and enables them to momentarily inhabit and actually see the potential of urban greening and inspired place-making. Please join us for an evening with six architects that have started their own firms and are still actively practicing. In these economic times, it seems like the perfect time to start your own endeavor. If you’re thinking of starting or have already started, your own firm, you should join us to gain some pearls of wisdom. Even if you’re not starting your own firm, this will be a fascinating evening with six architects that have had varied and interesting careers. The format of the evening is an open panel; be prepared to ask questions. We will start at 6:00pm with a reception with light refreshments. The program will begin at 6:30pm. Cecelia W. Denegre, AIA, IIDA, CDA&I Architecture and Interiors, Ltd. Sponsored by the Women in Architecture Committee. JUST ADD WATER selected for Center for Architecture exhibition. See PROJECTS post JUST ADD WATER for more information. PHILADELPHIA – The City of Philadelphia and Philadelphia Water Department (PWD) are ready to begin an exciting chapter of its Green City, Clean Waters Plan. On June 1, the PA Department of Environmental Protection (PADEP) and PWD will sign a groundbreaking agreement that will allow the PWD to officially embark on the implementation of its innovative strategy that uses green stormwater infrastructure to substantially reduce Combined Sewer Overflows (CSOs) to its waterways. PWD submitted the plan to the US EPA and PADEP in September, 2009, after vetting the plan with an enthusiastic public. Green City, Clean Waters lays the groundwork for the PWD to spend approximately $2 billion over the next 25 years to use primarily green infrastructure, such as – stormwater tree trenches, vegetated bumpouts, porous asphalt, rain gardens, sidewalk planters – as a means to transform manmade surfaces that repel the rain to Greened Acres which capture rainwater runoff, which then infiltrates, stores and manage the rain as a precious resource – just like Mother Nature. The plan also includes wastewater treatment facility enhancements and pipe renewal and replacement. Green City, Clean Waters works in tandem with the Mayor’s Greenworks Philadelphia vision in order to reinvent Philadelphia as a green, sustainable city of the future. PWD has softly launched the plan over the last few years to develop green infrastructure designs that work best in the Philadelphia landscape. These early projects serve as public demonstrations for citizens and provide the PWD and its many partners with early opportunities to monitor and improve the efficiencies of these practices. A list of featured projects – and information on Green City, Clean Waters can be found at PWD’s website: http://www.phillywatersheds.org. 2009 OUTSTANDING FIRM AWARD for work with the Miquon School in Conshohocken PA.